← The day Pye stowed away in the RV chassis for 150 miles. For the two weeks after taking my online dating photos offline, I had a blast hanging out with some fellow single RVers at the get together at the coast. This was when Pye stowed away in the RV chassis for 150 miles. I still can’t believe how many opportunities she had to abandon the RV and take off, but she stayed with it. This gives me hope that someday she just might become a willing co-pilot. Meanwhile, my dating profile photos were offline and I received no notifications of interest – not one. I added them back in over the weekend. Since then, I have received about 80 indications of interest – but no emails. I look through as many as time allows, and send the same back to those I also like. There are five mutual likes. As we wait for the brave ones to contact me, I’m going to show you some snakes. No, no, no! I’m not referring to the “snakes” in the pictures the half-dressed men have sent of themselves. Although, I probably would post them if I didn’t think I’d be breaking some kind of copyright or privacy law. So the title of this post is not a reference to men and the online dating arena. But I can see how you might have made that connection. Everyone knows there are all sorts of farms in Texas. In New Braunfels, part of Texas Hill Country, there is a snake farm. The Snake Farm is a small roadside zoo that specializes in snakes – the kind that slither. You enter the front building, a store chock full of souvenirs and knick-knacks. After you pay the $10 entrance fee, and decide you can stomach the pungent odor of urine, you can enter the snake rooms, where all manner of reptiles line the walls. Some of you probably remember the moment I became a Texan (at least by my standards), when I had the brush with the rattlesnake. Snakes don’t much scare me, but they do scare the male friend I went with. Most men I know are afraid of snakes, but the women aren’t. Perplexing, isn’t it? Big albino snake. I think it’s the one seen in an episode of Dirty Jobs. 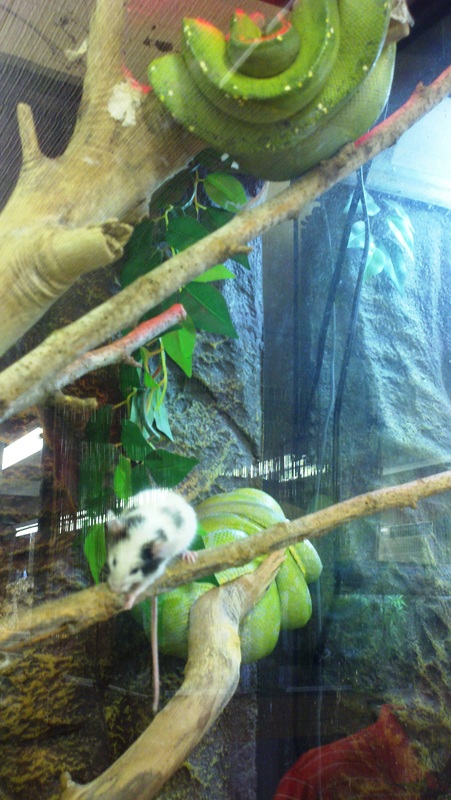 And there above, in fluffy black and white fur, is the reason I could never own a pet snake. 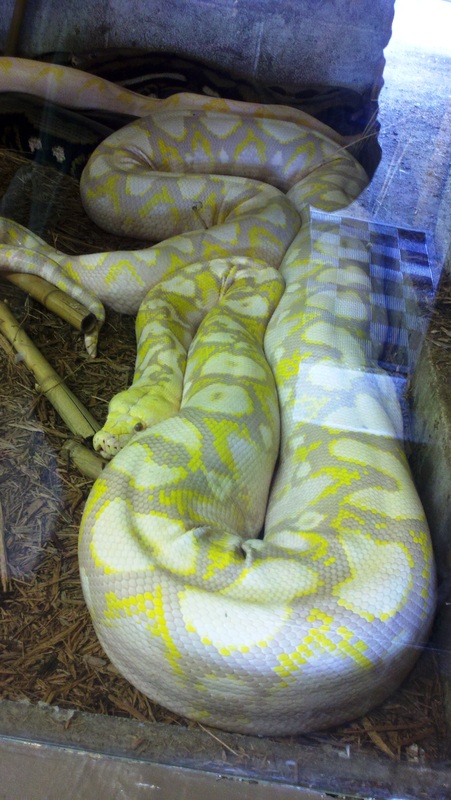 The two large green things that look like bunches of unripe bananas are actually sleeping snakes. The poor little rat, aware of the imminent doom, was trying to get out, and looked at us as if it knew we had the ability to let it out. It’s little pleading looks broke my heart. Probably best not to visit at feeding time. Mike Rowe wrestling a snake. Yup, works for me! My future husband, Mike Rowe, taped an episode of Dirty Jobs at The Snake Farm. 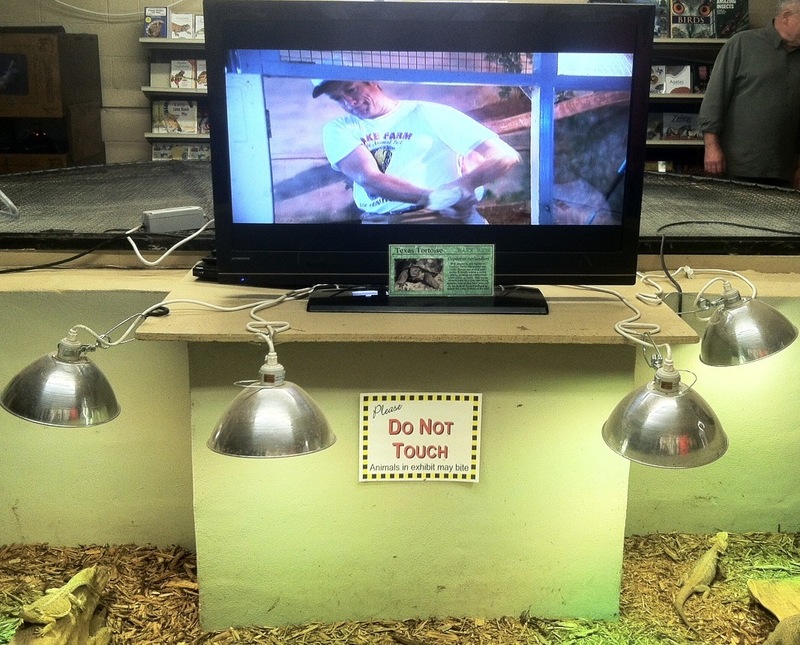 On the TV screen in the background, you can see Mike handling the very large snake between his legs. Petting the pot bellied pigs. Once you get through the snake rooms, you can go outside and see myriad creatures: birds; zebras, pot bellied pigs, monkeys, goats in a petting pen, etc. I’ll leave you all with a slideshow of the zoo. 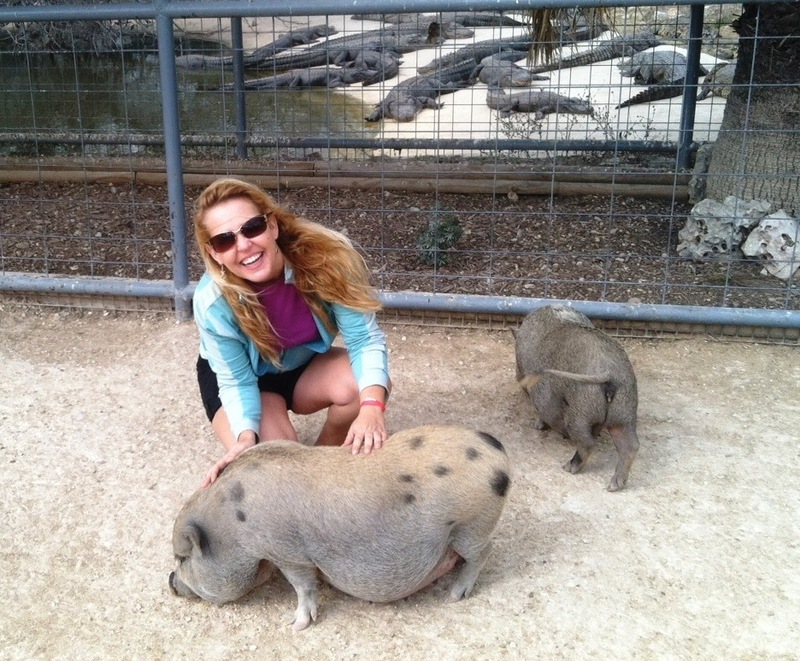 Pot bellied pigs… is that where pot roast comes from? Nooo, say it isn’t so! I love pot bellied pigs, they’re so cute!